The seats are leather but the leather is not a solid sheet. It is a hole punch design. This hole punch design tends to act like perforations and the leather tears easily on the seat. The gas mileage is also not nearly as good as I had expected a Kia to be. It gets less than 20 highway miles. I am also not impressed with the V-6. I have driven several friends cars that are only 4 cylinder that have more pick up and acceleration than my car with the V-6. I do enjoy the room inside the vehicle. It is small enough to park relatively easily but yet has more than enough space to hold 3 adults across the back seat. I have also put the back seats down and used the space to haul many items such as tables, dressers, mulch, timber etc and it has sufficient room for what I need. Kia Sportage for the growing active family. The Kia Sportage is a great family sized vehicle. The hatchback provides easy access and plenty of space for groceries and other family needs. The backseat area has plenty of legroom, even for adults. The ability to drop into 4 wheel drive with ease is a great feature. Some of the cost in repairs for the Kia can be more costly than other vehicles in its model. The headlights are plastic covered so be prepared to have them serviced yearly to keep them clear. You have to make sure when the oil is changed that a new oil plug is placed or you will have oil leak issues. But overall, i would recommend the Kia Sportage as a great vehicle option for the average growing family. Black exterior, grey interior. SUV shape and has a ton of room for road trips. The ac is not the best during the summer here in phoenix. It is okay throughout the rest of the year, though. It is a very smooth driving car. They will last you for a lifetime, mine is on its last 199k miles, and still drives good. It does not go very fast at all, and takes a while to finally pick up speed. All of the door handles broke literally the same week, and I had to replace all including the whole driver’s door. Speakers could definitely have better quality. Also it is a gas eater. 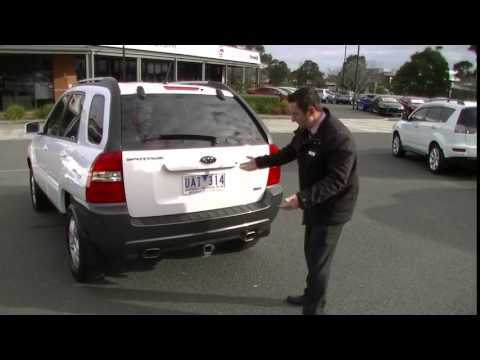 2006 Kia Sportage, Car Review.